This perfectly delicious Cucumber Edamame Salad with Ginger-Soy Vinaigrette is my latest obsession. 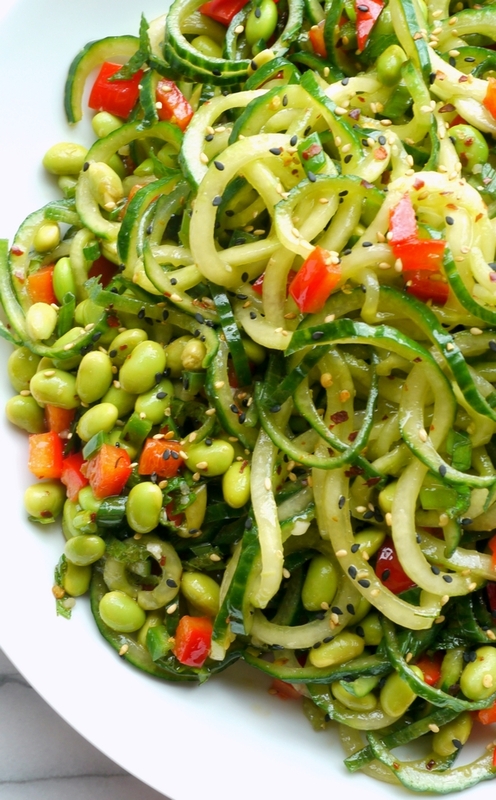 The vinaigrette is perfectly balanced over these spiralized cucumber noodles and protein rich edamame. It’s the perfect side dish. I currently have two obsessions going on with this salad. First, I have always loved edamame. I could sit and eat them every day. I enjoy them in all salads and also as an appetizer at certain restaurants. My second obsession is spiralized everything. I seriously love turning so many of my veggies into noodles, especially cucumbers. The texture is so much better this way and the presentation is spot on gorgeous. Up until now, this Avocado and Three Bean Salad has been my favorite side dish, with this Greek Pasta Salad a close second. 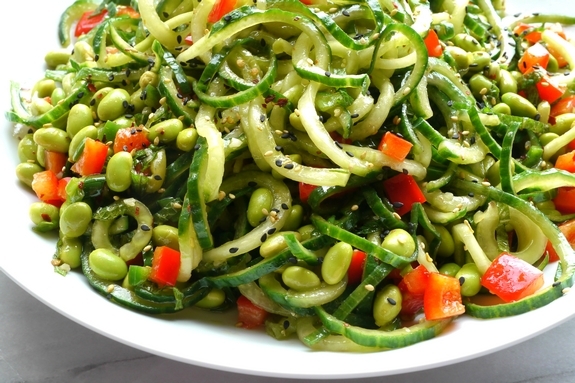 However, this Cucumber Edamame Salad with Ginger-Soy Vinaigrette has really got my attention. It’s that good. Since I’m obsessed with spiralizing I knew I wanted to be able to make it happen as easy as possible. I currently have the spiralizing attachment that hooks right onto my Kitchen Aid mixer. It works so well and is heavy duty. However, I know a lot of people who use this spiralizer if they don’t have a Kitchen Aid mixer and love it. 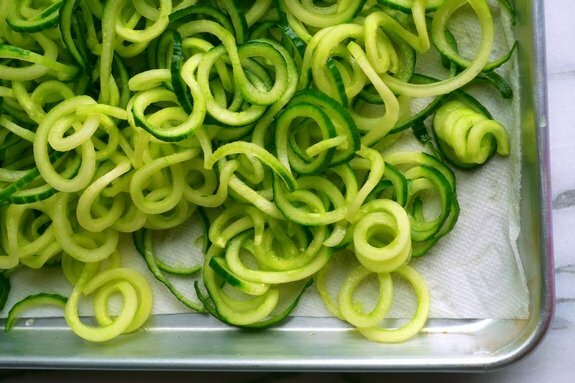 Either way, get to spiralizing this summer if you haven’t already. You’ll likely become as obsessed as I have. This is such a great recipe to serve with your favorite burger and works nicely as a palate cleanser if you happen to be serving something spicy. 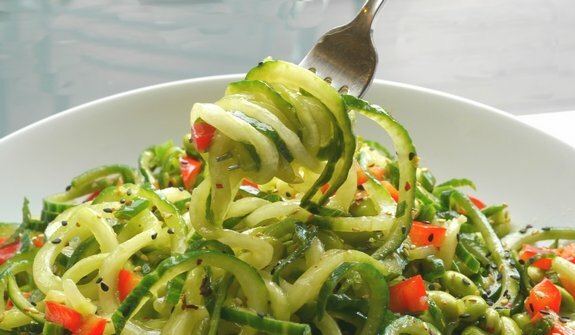 If you do not use a spiralizer for this recipe and choose to just thinly slice your cucumbers, I would suggest slicing them with a mandoline to get them paper thin. There are so many great salads to make as side dishes for summertime entertaining. I know this Easy Tomato Mozzarella Salad is on my list. It looks amazing just like this Caesar Pasta Salad. One summer salad I always enjoy is a Zucchini and Tomato Salad as well as a good Broccoli Salad. You can’t go wrong with any of these. Spiralize or very thinly slice your cucumbers, soaking up any excess liquid with a paper towel, just until they are not so wet. Toss together cucumbers, edamame, red bell pepper and jalapeno in a large bowl. Set aside. In a small bowl or mason jar, add all ingredients for the vinaigrette and shake or whisk well. Pour dressing into the cucumber mixture and toss well. Sprinkle with sesame seeds. Cover and refrigerate for at least 2 hours. Serve within 24 hours for best results. Note: The texture of the cucumbers when spiralized is preferred. I highly suggest it. 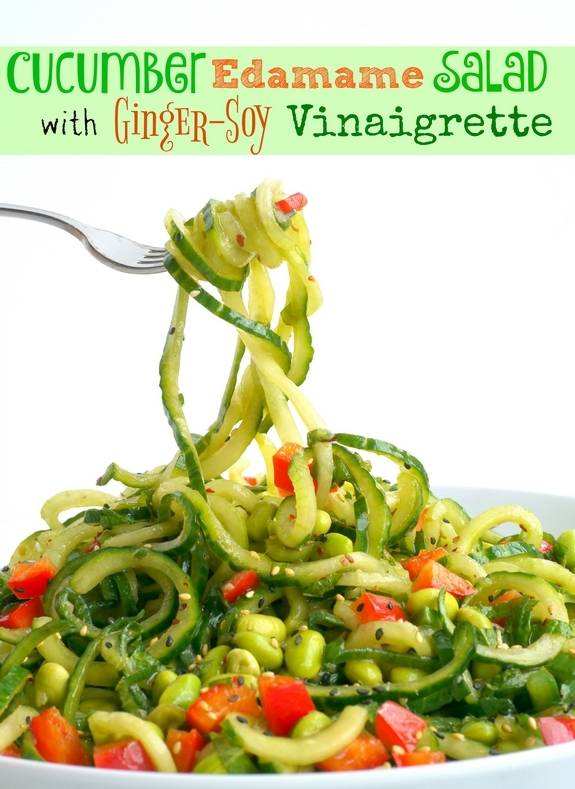 Oh my gosh, I just got a spiralizer and can’t wait to try this! You are going to be spiralizing all the things! This vinaigrette sounds perfect for this! I have to try it! I am totally on board the spiralizer trend. That dressing also sounds delicious! So fresh and vibrant, I love this ingredient combo! This salad is so cute and healthy! I need to try this version of vinaigrette! This salad is just what my week needs! I can’t believe I have never spiralized anything yet!! This salad is really want my family needs this weekend. I would try it out. Thanks for sharing. Can you make this in advance? How many days? I’d love to make this as a main dish. What protein would you recommend? Would thinly sliced steak be too overwhelming? I would stick with something light like chicken or salmon.